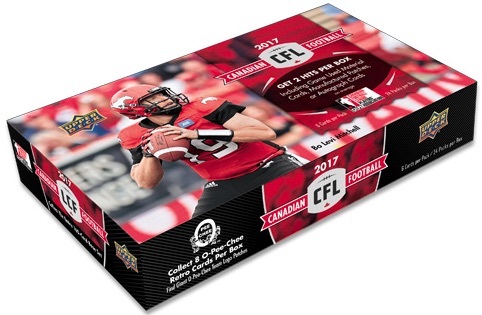 Bringing the Canadian gridiron to cardboard for another season, 2017 Upper Deck CFL Football has an old-school feel with a simple format and throwback designs. Each Canada-only hobby box delivers one relic card and an assortment of inserts and short prints. Broken into a few groups, the base set consists of 160 cards. 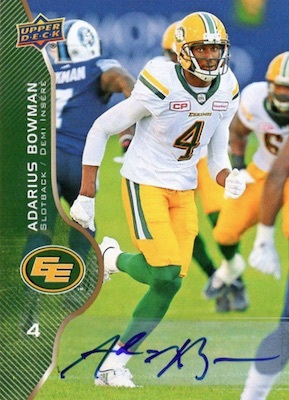 The 2017 Upper Deck CFL Football checklist starts with 100 offensive players and the remaining 60 cards are short prints, including Defense/Special Teams and All-Stars (1:4 packs). Dropping two per box, 2017 Upper Deck CFL Football does offer a few premium inserts. Taking the main set up a notch, each base subset also has limited Autograph parallels, with base Offense (1:64 packs), Defense/Special Teams and All-Stars (1:360 packs) versions. Decreasing from 2016, which had two relics, collectors can now find at least one UD Game Jersey (1:17 packs) card per box. These also come as UD Game Patch parallels, numbered to 15 copies. Another regular inclusion, the commemorative O-Pee-Chee Team Logo Patch cards are a tough pull at 1:108 packs. 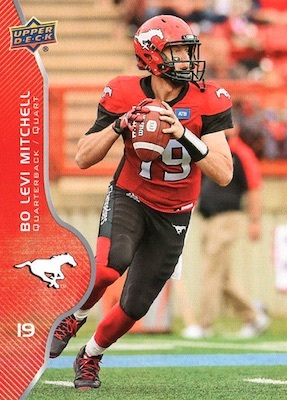 A small assortment of inserts help close out 2017 Upper Deck CFL Football. The main choice, O-Pee-Chee Retro (1:3 packs) highlights players with a vintage look. 160 cards, including 60 short prints. Defense/Special Teams and All-Stars subsets are 1:3.33 hobby packs. 86 cards, including 29 short prints. 1:64 hobby packs. Shop on eBay. Defense/Special Teams and All-Stars subsets are 1:360 hobby packs. 40 cards. 1:2.5 hobby packs. 9 cards. 1:108 hobby packs. 20 cards. 1:17 hobby packs. Hey Trey Will this product be available just in Canada? I don’t have official word on that but it very much looks to be the case. Looking forward to collecting this again! I like the inclusion of the mascots! Too bad the number of jersey cards are being reduced, those are nice to get. It would be nice if the Veteran Redemption consisted of players who stood out during the regular season and playoffs who also don’t have a regular base card (or even those who switched teams mid season) instead of players who already have a base card. The only “update” was adding a line of stats, which would be there this year. 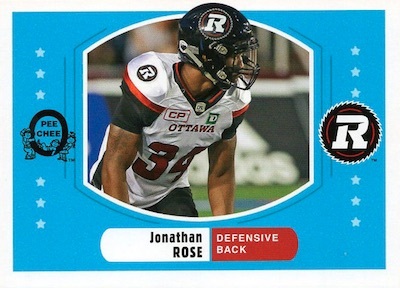 Anyway, nice to see the CFL getting some hobby love even if it is by Upper Deck. I see the release date is the end of October? Is that right? I thought it came out in July last year. At the price point, there’s absolutely no reason to not have an autograph per box. It’s pretty disappointing considering they have no competition in this sport, and free reign to do whatever they want… that they go even below the minimum of what should be in the product, when it’s the only one they do all year. CFL autographs aren’t expensive to acquire I’m sure. Huge disappointment. Bought a case. Got 8 autos out of 16 boxes. The logo cards are no longer embroidered, but flat and cheap looking. They also discontinued the blank-back O-Pee-Chee inserts and cut down the number of jersey cards and inserts. Released after Grey Cup! 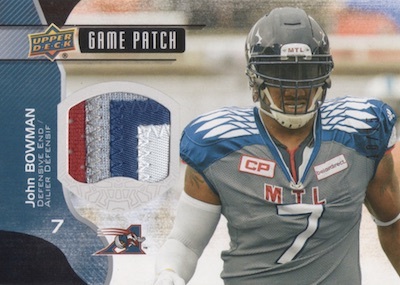 This is the worst set UD has made since they started producing CFL cards in 2014. If they care this little, they should stop making this product.